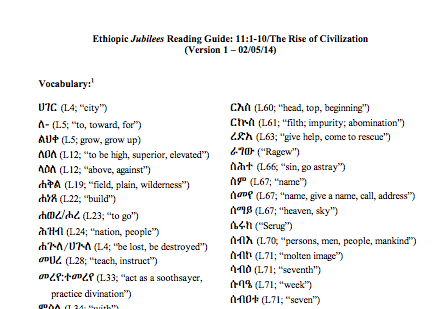 I've been working on a project involving Ethiopic Jubilees and thought I'd make a little of the data available for those who are learning Ge'ez. I've put together a little reading guide for Jub. 11:1-10, that exciting bit of the book that talks about the beginnings of civilization after the flood. It turns out that it didn't take long for humans to start killing, enslaving, and oppressing each other. The reading guide has a list of all of the Ge'ez vocabulary for this section, as well as English glosses and the page reference for the appropriate entry in Leslau's concise lexicon. I also included a few bullet points that point you to parts of Lambdin or Leslau that will help in translating the text. You can access the reading guide here. Great work! Can you post a translation of Jubilees 49:1, using an old Geez version as the source? That reading guide is great too.